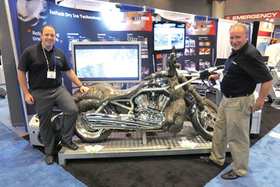 Kevin Gildea (left) and Tom Costello show off the Harley Davidson motorcycle that was the centerpiece of IceTech America's expo booth. NASHVILLE, Tenn.—IceTech has sold dry ice blasting and dry ice production equipment to countless industries in more than 180 countries, yet the majority of firms that could benefit from the technology probably don't know it exists. That's the message of officials from IceTech America Inc., which exhibited its machines at the ACS Rubber Division's International Elastomer Conference and Rubber Expo in Nashville, Tenn.
IceTech was founded in Denmark in 1998 and set up its U.S. office in 2006 in West Chester, Ohio, all along serving customers in the tire and rubber industry, in addition to such sectors as steel, plastics, automotive, power, food, marine and pharmaceuticals, just to name a few. Tom Costello, area sales manager for IceTech America, said often those who could use dry ice blasting continue to use more traditional cleaning methods, most of which are more labor intensive. IceTech continues to improve the technology, said Kevin Gildea, who handles inside sales and marketing for the U.S. unit. “With some of the advancements in our technology and some of our different nozzle combinations that we've developed, it's really expanded what you can do with dry ice blasting,” he said. Dry ice blasting is typically used in tire manufacturing for mold cleaning. IceTech's equipment allows end users to clean mold sidewalls without having to remove the mold from the press, preventing potential damage caused by removal and reinstallation of the mold. Gildea said that mold-fouling, caused by rubber-off gassing in vent cavities, is solved easily with dry ice blasting because it allows equipment to be cleaned more regularly. “IceTech dry ice blasting equipment is an effective tool for eliminating blemishes and unwanted flash due to residue from rubber compounds that can collect in injection molds,” he said. The company's technology uses dry ice pellets made from recycled carbon dioxide. The dry ice pellets turn back into carbon dioxide—or sublimate—when they come into contact with equipment. Gildea said the pellets go from the solid to gas state without ever becoming a liquid, providing environmental benefits over other cleaning methods that use hazardous chemicals and solvents. Gildea said customers with zero-landfill initiatives especially appreciate this property. All equipment is manufactured in Denmark. The firm offers eight manual models, ranging from roughly $12,000 to $25,000, according to Gildea. IceTech also offers automated versions, including custom-made ones, for those with higher-volume needs, Costello said. The price goes up exponentially, but the automated machines offer faster cleaning, more consistency and eliminate operator error. Its U.S. location in West Chester stocks all the standard models, stocks parts to all machines and offers demonstrations at the facility. It moved into its current 6,000-sq.-ft. location two years ago, doubling the size of its previous location, but it already is close to needing more space, Gildea said. Personnel also will visit potential customers and demonstrate IceTech's capabilities. “It almost always requires a demonstration at a customer's facility to sell a machine,” Costello said. Most start with a manual machine, and larger molders and tire makers often later upgrade to an automated system, Costello said. Gildea said, though, that the technology isn't just for cleaning industrial equipment. It can be used for more delicate operations, such as cleaning electrical equipment. “You could take the name off of a business card without damaging the card,” he said.